Elo Ozumba fights for the ball. The junior forward and the Wildcats picked up a Big Ten win in overtime at Rutgers on Friday. For about 80 minutes Friday, it seemed like Rutgers would get its first win of the season, but Northwestern had other plans. 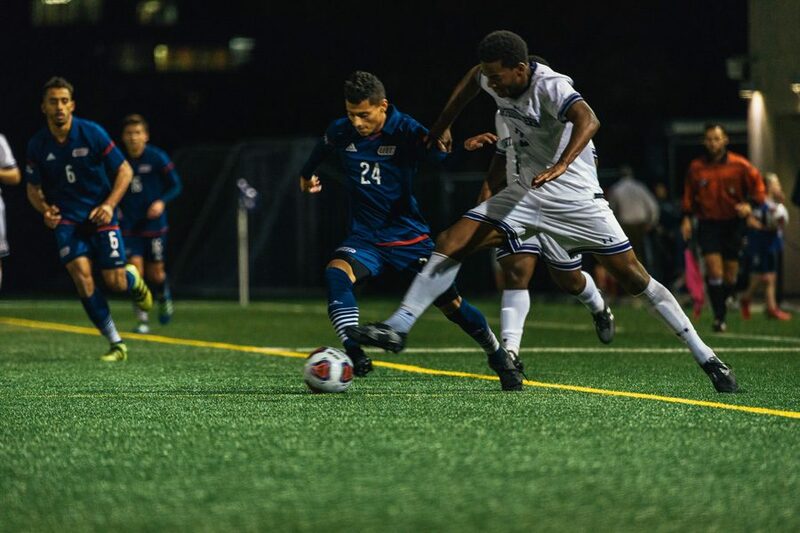 The Wildcats (3-9-1, 2-3-1 Big Ten) managed to defeat conference rival Rutgers (0-10-2, 0-4-2) 2-1 thanks to a last-ditch equalizer by senior midfielder Brandon Medina and an overtime golden goal by freshman defender Mattias Tomasino. The Scarlet Knights scored the night’s first goal in the 24th minute, and the game continued with a 1-0 scoreline until late in the second half. Despite the deficit, NU continued battling on the field, outshooting Rutgers 16 to 15. The tables finally turned when Coach Tim Lenahan substituted Medina onto the field in the 81st minute. Seven minutes later, Medina turned the game on its head, scoring the Cats’ first goal and forcing overtime. Though it was Medina’s third career goal, it was quite unlike his first two, which both came off penalty kicks against Florida Gulf Coast back in August. Medina said this one was instinctive, as he fired a volley from the top of the box into the corner to equalize in the 88th minute. “(It) was one of those moments when it’s just you and the ball and you don’t see anything around you,” Medina said. Medina’s goal revitalized NU heading into sudden-death overtime. Ten minutes into extra time, Tomasino scored his first collegiate goal, closing the game and allowing the Cats to leave New Jersey with a guaranteed spot in the Big Ten Tournament. Tomasino scored off a cross from sophomore midfielder Camden Buescher. Coach Lenahan said Tomasino’s goal might be the first time in school history the brother of an NU goalkeeper scored a game-winning goal. Mattias Tomasino joined his brother, junior Francisco Tomasino, on the team this year. On Friday, the Miami-natives played the entirety of the 100 minutes of the game together. Riding some momentum after one of its rare wins this season, Lenahan said the team is now turning its focus to No. 2 Notre Dame on Tuesday. The Fighting Irish (10-2-1) lost 1-0 Friday night against Virginia. They will face the Cats Tuesday night at Toyota Field, home to the Chicago Fire of the MLS, where NU tied Notre Dame 1-1 last season.